After a long delay to fix bug, Apple has finally released the latest version of its mobile operating system iOS 4.2.1 for iPad, iPhone and iPod touch. The iOS 4.2.1 has been incorporated with lots of new features, including Multitasking, Folders, Unified Inbox, Game Center, AirPlay, AirPrint and Find My iPhone (or iPad or iPod touch). Multitasking, Folders and Unified Inbox – iPad users can now run their favorite apps and switch between them instantly, organize their apps with drag-and-drop simplicity using Folders and enjoy improved Mail features with a Unified Inbox, fast inbox switching and a threaded message view. 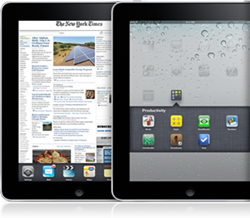 Game Center – allows iPad, iPhone and iPod touch users to challenge and play games with friends online. AirPlay – streams music, video and photos wirelessly from iPad, iPhone and iPod touch to Apple TV with AirPlay features. AirPrint – the next-generation Wi-Fi print architecture that dramatically simplifies printing by completely eliminating printer drivers. Find My iPhone (or iPad or iPod touch) – free to use without a MobileMe subscription.